This is a typical recipe from the Thracian region of southern Bulgaria. It is eaten at harvest time during the hottest days of the year. Place the parsley in the bottom of an oven dish. S;ice the tomatoes, discarding the end pieces. Lay the tomatoes in the dish, overlapping slightly. Sprinkle each layer with salt, pepper and a tiny amount of sweetener. 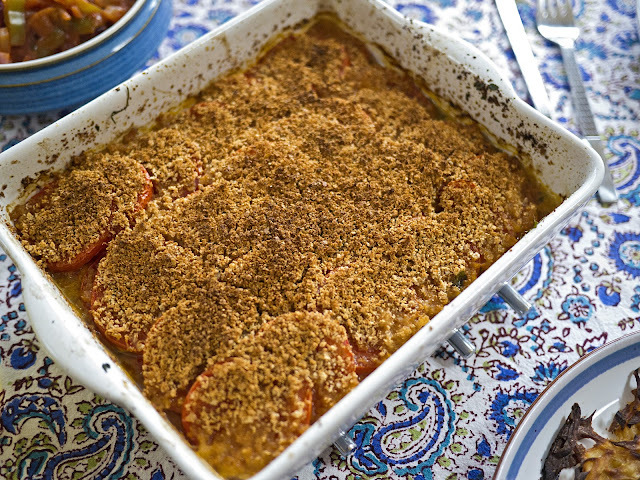 Mix the breadcrumbs with the paprika, salt and pepper to taste and add over the top of the tomatoes. Bake for 20-30 minutes at 200°C. Can be served as a vegetarian main dish or as a side dish to meat.